Need proof? Every year, the Federal Reserve forecasts economic growth on a one-year forward basis. In 2010, they forecast 2011; in 2011 they forecast 2012, and so on. From 2009 to 2016, the Fed was wrong eight years in a row. When I say “wrong” I mean by orders of magnitude. But, the Fed would forecast 3.5% growth and it would come in at 2.2%. That’s not even close considering that growth is confined to plus or minus 4% in the vast majority of years. Let’s not be too hard on the Fed. The IMF forecasts were just as bad. For further evidence, have a look at Chart 1 below. It shows the implied path of Fed interest rate hikes from 2008 to 2021 based on Fed Funds futures contracts traded on the Chicago Mercantile Exchange. This forecast is not from a specific institution. Instead, it represents the “wisdom of crowds” or the distilled views of all market participants as aggregated by market prices. The red line shows the actual path of interest rates over time. 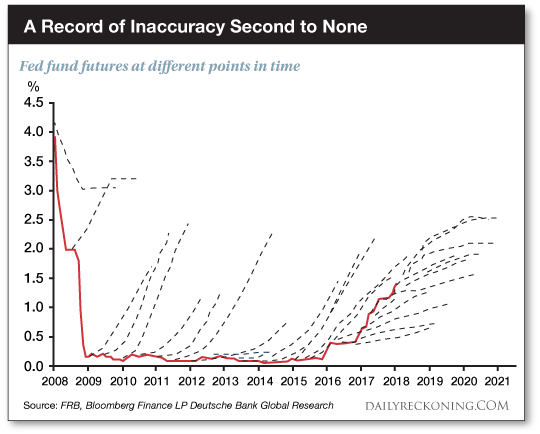 The black dotted lines show the expected path of interest rates based on Fed Funds futures contracts traded on the CME at various points in time. As you can see, from 2009 – 2015, the market consistently expected higher rates than the Fed delivered. Those are the black dotted lines above the red line. From 2016-2018, the market consistently expected lower rates than the Fed delivered. Those are the black dotted lines below the red line. Right now, the market seems to have it about right, (the black dotted lines starting in 2018 and predicting higher rates), but we’ll see what happens. My expectation is that the Fed is overtightening and will have to back off from rate hikes later this year. That means the red line will trend below the black dotted lines and the market will miss the mark again. The Fed Funds futures contract is one of the most liquid and heavily traded contracts in the world. 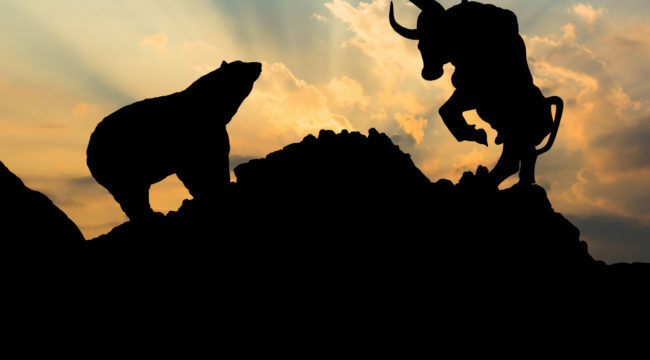 If any futures contract reflects “the wisdom of crowds,” this is it. What the results show is that “the wisdom of crowds” does not have very high predictive value. It’s just as faulty as the professional forecasts from the Fed and IMF. The problem with the “experts” is not that they’re dopes (they’re not), or they’re not trying hard (they are). The problem is that they use the wrong models. The smartest person in the world working as hard as possible will always be wrong if you use the wrong model. That why the IMF, Fed, and the wisdom of crowds bat below .500. They’re using the wrong models. At Project Prophesy, I’ve got the right models, which I developed for the CIA working in collaboration with top applied mathematicians and physicists at places like the Los Alamos National Laboratory and the Applied Physics Laboratory. This is the methodology behind Project Prophesy, which allows my readers access to actionable recommendations they won’t find elsewhere.